A bunch of Blu-ray 2-packs were released today. These are sold side-by-side but seemingly for the price of an average single Blu-ray disc. Not a bad deal eh? 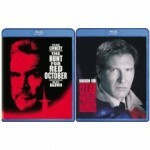 Highlights include a 2-pack of Harrison Ford classics Clear and Present Danger/The Hunt for Red October; Johnny Depp, Helena Bonham Carter and Christina Ricci fans can get the Sweeney Todd/Sleepy Hollow 2-pack; and Tom Cruise stars in Mission: Impossible/Mission: Impossible 2 also available as a specially priced 2-pack.